Convincing a customer to spend a few more dollars for a premium chemical stop-leak product can be a tough sell. But the benefits – for customers and your store – are worth it. Choosing premium products can save customers money and effort over time because their repairs last longer and the products protect the vehicle against future breakdowns. At the same time, these premium sales boost your store’s bottom line. So how do you successfully move a customer from an entry-level product to a premium solution? Start by educating yourself on the options. Often there are several chemical solutions to a vehicle problem, and your customers count on you to help them determine which one is best. For example, Bar’s Leaks alone offers eight different cooling system stop-leak products. Study the product packaging, visit the manufacturers’ websites – call the company if you have to – until you understand the differences between products. Ask your customer what the problem is and listen carefully to the answer. Does the customer know exactly what’s leaking? Does it sound like a simple leak that an entry-level product would fix? If so, recommend an appropriate product. Otherwise, ask some follow-up questions. What color is the liquid? Where is the customer finding it? How often? How much? When did this leak start? How old is the vehicle? Are there other issues with the vehicle, like overheating? If it sounds like the vehicle has multiple problems, then a premium product that addresses multiple issues and protects against future damage is in order. And don’t feel bad for asking a lot of questions – this tactic helps build customers’ trust in in you. Point out how choosing the premium product can save the customer money. 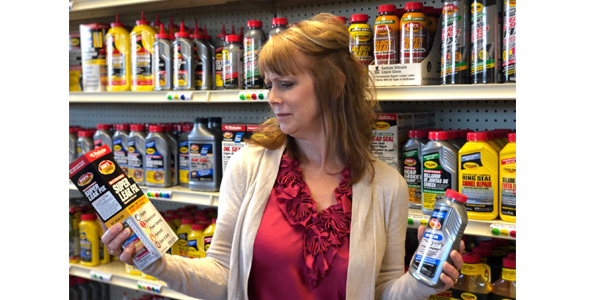 For example, “This product creates a permanent seal that’s even stronger than the original, so you won’t ever have to buy another bottle of radiator stop leak.” Highlight any available rebates that can make a premium product even more affordable. You want customers to trust you, so don’t upsell when a regular product will work fine. A satisfied, repeat customer always should be the goal. Bar’s Leaks provided this article. For more information about the full range of Bar’s Leaks stop-leak products, visit barsleaks.com.